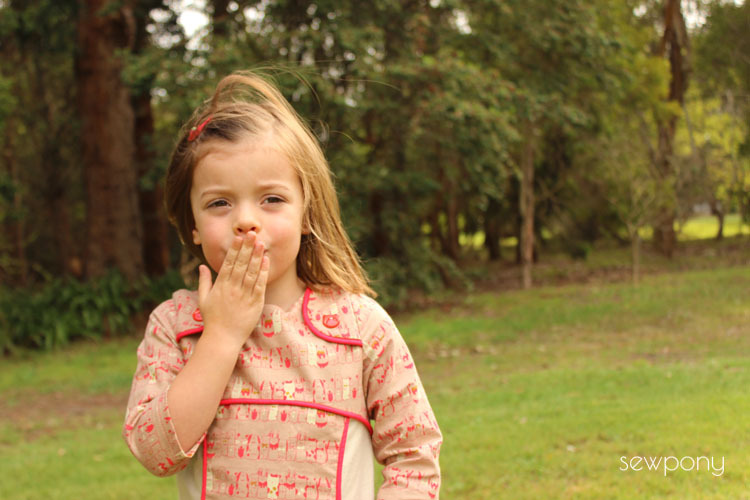 I started sewing up another Miss Polly dress to retest the fit of the three quarter sleeves a couple of weeks ago and finished it just before the Easter weekend. I have had this fabric in my stash for nearly a year. I originally bought it to be the main fabric for Emily's quilt. But after changing my mind several times with the colour scheme and design of her quilt, I ended up going with completely different colours. Which meant I had about two metres of this gorgeous fabric to use for the girls. The fabric is so adorable. It is called Harajuku in Rose from the Tokyo train ride collection by Sarah Watts. I thought it was still best suited to Emily in a dress since it is so playful. The colours are gorgeous - a dusty browny pink with lipstick red, cream and mustard. Little bunnies, cats, rabbits and dogs all squashed in together. I used a nice neutral brushed cotton for the under skirt and lipstick red for the piping. This piping is a little thicker than I usually go because I often find it hard to find just the right diameter. I found some cute cat buttons to match the dress. I am really happy with how the sleeves look now. There is also the option of making them full length sleeves. 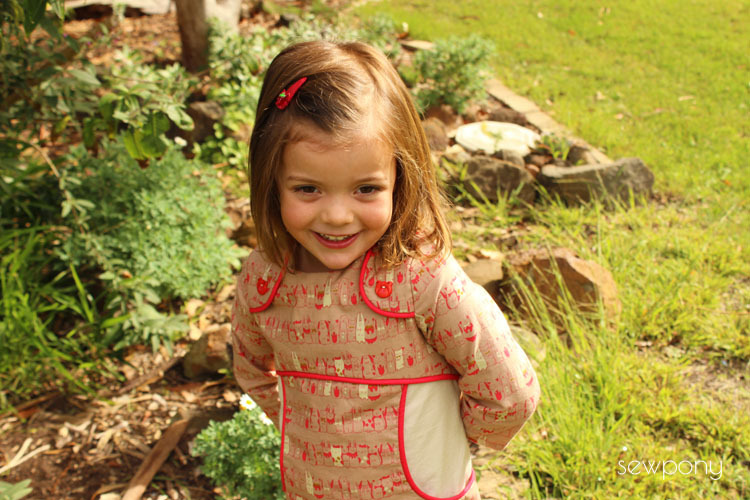 I am sewing up an autumn/winter style one with long sleeves for Issie at the moment too. Our pomegranate tree makes a nice back drop! I didn't intend on this being an Easter dress, but with the bunnies on there it was perfect for an Easter egg hunt! The pocket was big enough for lots of little eggs! 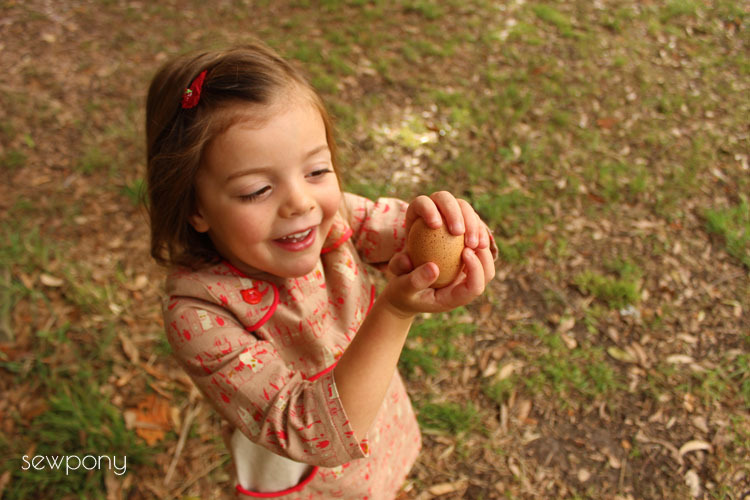 Emily loves collecting our eggs every morning. We usually get three from our three lovely chooks. On Easter Sunday, she found sparkly eggs in the hutch too! 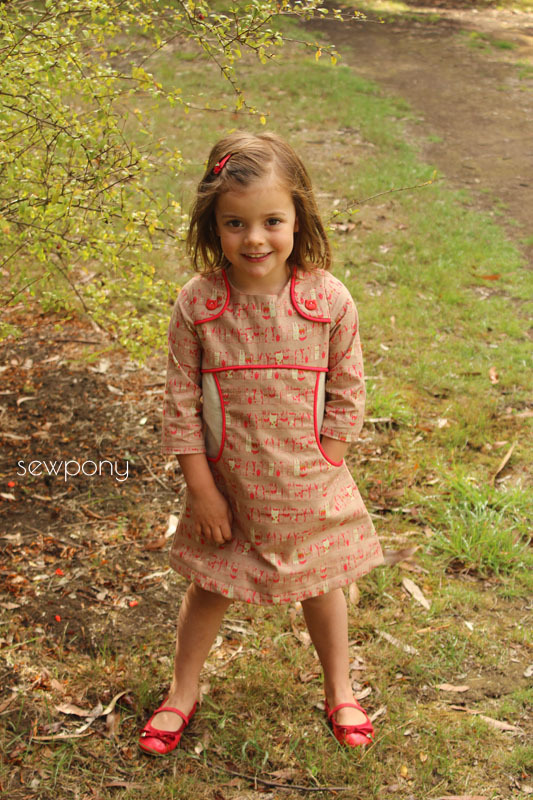 You can buy the Miss Polly dress pattern here. Love love love this version Suz ! 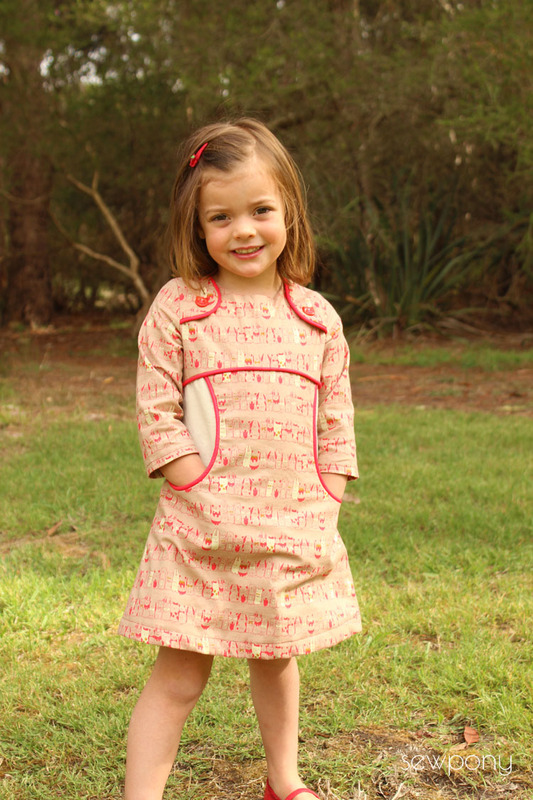 The fabrics, piping and buttons are perfect ! 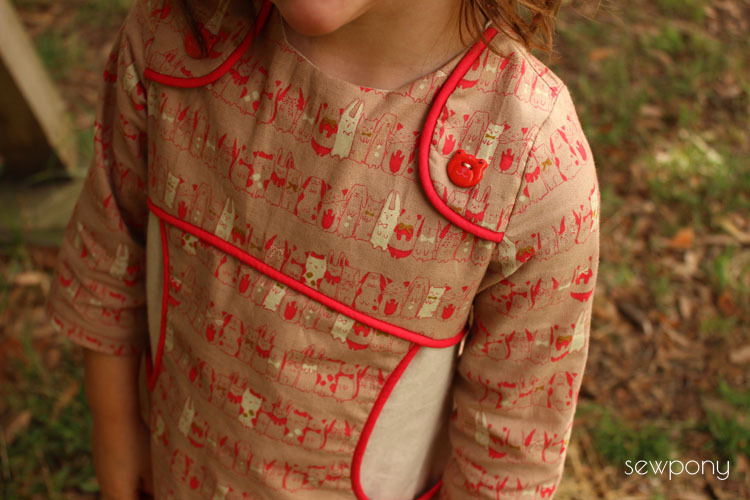 I love that fabric, it makes a very beautiful miss Polly! Oh I just love this version! Perfect combination... she looks sooooo cute !!! 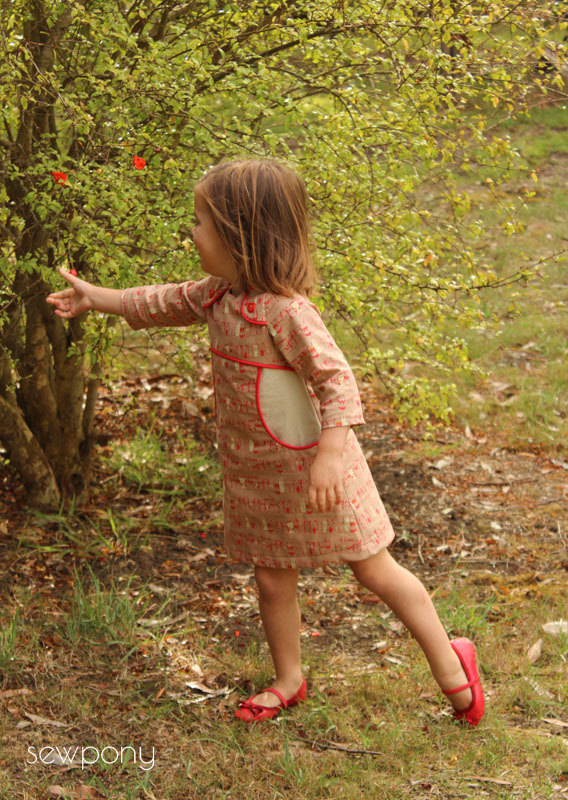 such a sweet dress for Easter! Oooh, how adorable!! I love the fabric too! !